The app has features that matches students based on their location and interests, a smart-syncing timetable and an accumulated local feed for student discounts. University students always have a problem finding sufficient information in regards to university events and competitions; most of the time, the only way they can find it is by looking at notice boards filled with random stuff. When you have a situation such as finding suitable student housemates, you end up turning to social media platforms like Facebook to find one. These are just a few things that students have to face throughout their uni days, but this Malaysian startup run by University of Malaya undergraduates is looking to putting an end to it with an app called UniChat. “When it came to university related matters, there wasn’t a specific platform that gathers students’ issues and tackles the problems, ” Hung Ngiap the brains behind UniChat explained. 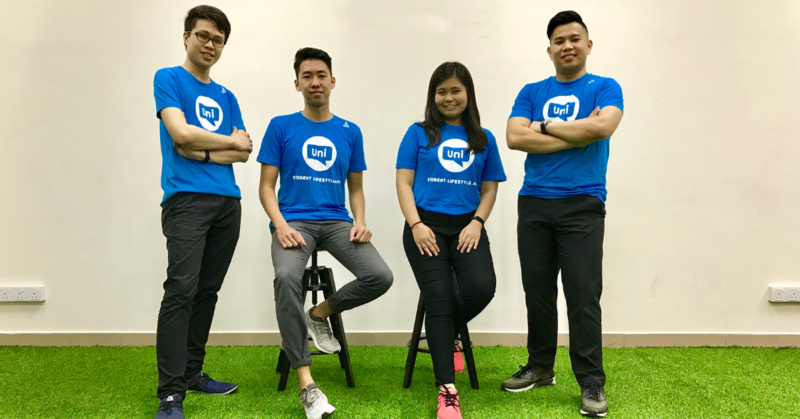 With strong intentions to bridge the gap between students by connecting all university students in Malaysia, Hung Ngiap assembled a team to create UniChat. As university students themselves, all the co-founders are still studying in University of Malaya and they hope to solve pain points as students in the student market itself. Hung Ngiap helped to develop the first prototype of UniChat. He is supported by: Jo Yi, a computer science student that manages the daily operations of UniChat; Dao Xiang who keeps an eye on the consumer market; and Foo Soon, a finance undergraduate who helps to plan the budget and marketing expenses. As all of them have experienced 3 years of university life, they fully understand that the university system and culture has grouped students into narrow and non-diverse groups. “Most of the students are only grouped with course mates due to limited exposure to other events and activities held by other faculties,” said Hung Ngiap. According to the team , private and public universities students have an almost equal ratio of enrollment and although the two serve the same age group of students, there is still a huge cultural gap between private and public university students as they act differently due to lack of interaction between each other. Hence, UniChat comes in to provide a student-exclusive platform to bridge the gap and unite all students in Malaysia. It’s hard to avoid comparisons to dating platforms like Tinder, if you take a look at the screenshots and design. However, the team mentioned that UniChat is different as the users are only limited to university students compared to other apps where anyone can register. UniChat adopts a couple of methods to ensure that the platform is only open for student users. Firstly, is that users are required to sign up using their student emails that contain the “.edu” or similar verified education emails. As only active students have access to these emails, once they’re done with their studies they won’t be able to access the platform anymore. Secondly, users can sign up through their Facebook accounts which can be easier and more user friendly—however they still need to upload their student ID card as proof that they’re an active student. Moving forward, UniChat will combine both approaches, requiring users to sign up using their education email and upload their student ID card. “We do practice regular checks on users and provide immediate response to any reports made, making sure that each and every user are verified students and ensuring that the platform is safe for the users,” explained Jo Yi. UniChat monetises through one of their features called UniEat, which works similarly like the Entertainer app where users pay a subscription fee to enjoy one year’s worth of discounts from various merchants and restaurants. With a RM20 subscription, students are able to enjoy discounts of up to 40% for a period of 1 year. In the last quarter alone, UniChat achieved around 100 redemptions on UniEat per month at their partner restaurants, saving students around RM 5,000 over the last 3 months. 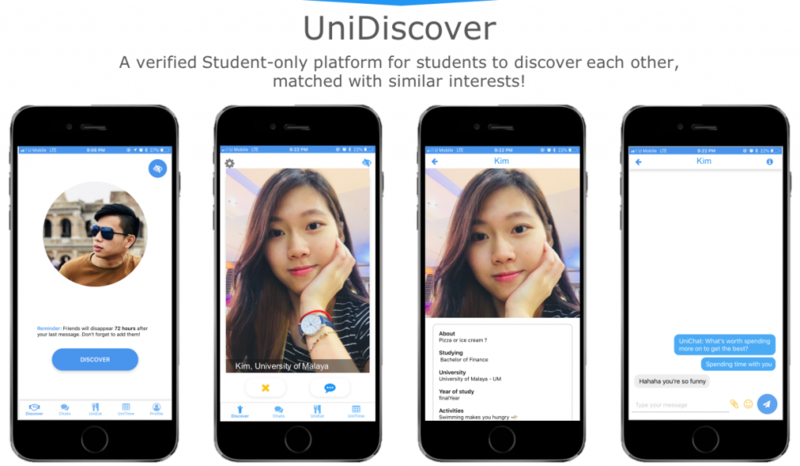 On top of their current features such as UniDiscover, UniTime and UniEat, UniChat wants to become a full-on lifestyle app for university students as they’re looking at implementing new features such as a takeaway and delivery service called “UniBungkus”. They’ve already done a pilot run of the service in University of Malaya during the exam week and were able to run the service with a delivery fee of as low as RM1. Furthermore, another feature they’re looking to introduce in the app is UniHostel where they rent out empty rooms of residential units for students who need a room to stay in. UniChat started with a capital of RM10,000 and after their soft launch in the first quarter of 2018, their user base has seen an average of 400 to 450 weekly signups since 2019 and they now have a total of 10,000 users. However, the team finds that it’s a constant challenge to get more users, since many students view UniChat as just another dating app. Fixing this perspective and getting even more users on board is something they’re actively working on. You can download the UniChat app for Android devices here and iOS devices here.